After years of apps for mobile devices I’ve tried many of them that are faith related. I’ve pretty much narrowed them down to just a few. The screenshot shows one of the newer ones I started using. It is The Examen Prayer by Father Michael Denk. “What’s the one most important prayer we should pray every day? St. Ignatius said you should never omit the Examen Prayer, also known as the Examination of Conscience, from your daily prayer.” It was recommended by my spiritual director and I use it primarily on my iPad and really like the journal feature. I still use my printed four volume Lituergy of the Hours when I’m home but these apps are what I’ve found to be the most handy while traveling. Most of my spiritual reading is now on my Kindle (app on iPad). My shoulder surgery recovery is going well enough that I spent a couple hours on the beach doing some fishing. The Gulf waters had some strong breakers and lots of grass but this bluefish found my bait. He became lunch for today. It’s amazing how tired out you can get doing something like this after major surgery. Besides pain, the hardest part for me is patience and wanting to do more than I should. I can’t deny getting down sometimes when it seems like everything hurts and I can’t do something I want to do. But I am very thankful for all the people who have helped me, starting with the doctors and nurses and all my family. I keep thanking God for the challenges in my life and all the blessings. Pain is a good thing to offer up and I try to remember to do so. I’m behind on this but better late than never. For Mother’s Day we went to the beach. Cindy is pictured with our daughters and Caitlin’s babies. The girls all spent the night in a hotel room on the beach and the boys went home. For this grand daddy it is amazing to see our little babies now having babies and already seeing them grow. No Grandpa can keep a smile off his face when he’s holding a little angel. Cove Angel Underwood is Cindy’s and my 3rd grand baby! She is a joy to hold and I love to hold her. We’ve been blessed that our daughter Caitlin and husband Clint now live here in Pensacola, FL and that Clint is the General Manager of our company. So we get to see the babies. They’re growing so fast. It’s getting hard to get Cindy to focus on work because she just wants to spend time with her “babies.” Cruz, the oldest is past three years old and is a handful. And Case, the middle boy is kind of like the class clown. Three different personalities and we love them dearly. 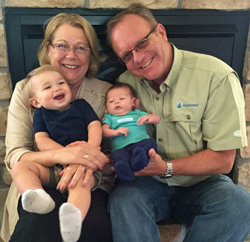 Last weekend Cindy and I got to visit our two grandsons, Cruz and new one, Case. Of course we loved seeing our daughter and her husband too. It’s hard to describe how wonderful it is to hold your grandson and to play with him. Cruz walks and although he talks a lot I have no idea what he’s saying yet. Case eats and sleeps a lot still but he’s got big blue eyes and I could stare at him forever. They are awesome reminders of the miracle of life and we can’t wait for our next opportunity to see them which will be when Case gets baptized!